As we wait to see whether Prodrive will make the grid in 2008 and, if so, with what chassis, speculation continues regarding the drivers that Dave Richards might pick for his team. Presuming that Prodrive get its wish and fields a McLaren product, the fancied incumbents would be the works team test drivers for 2007, Pedro de la Rosa and Gary Paffett. That would not be a bad pairing, the experience of de la Rosa teamed with the youth and speed of Paffett, and I doubt that Richards would do much better by looking further afield. 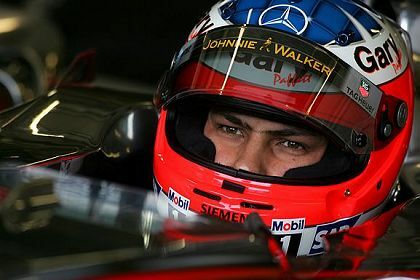 Pedro is well known amongst F1 fans, thanks to his occasional outings as a replacement race driver for McLaren, but Paffett chose a rather unusual route in his rise to F1 and is more of an enigma as a result. Although Gary took longer to reach F1 than Hamilton, there is some similarity in their results on the way. Whereas Lewis won the British Formula Renault Championship after a year in which he came 3rd, Gary chose the British Formula Vauxhall Junior Championship and won it after a year in its Class B. Both went from there into F3, Gary becoming British Scholarship Class Champion in his first year, Lewis becoming Euroseries F3 Champion after a year in which he finished 5th. At this point, their paths become very different. Hamilton went straight into GP2 and won in his first year, 2006, graduating from there straight into the McLaren F1 team - and we all know the result. Paffett, however, went to German F3 and finished 6th in 2001 before winning the championship the following year. The German Touring Car Championship beckoned and Gary became the first driver to win a race in a year-old car. Eleventh in 2003, he progressed to runner-up the following year and won the championship in 2005. There followed two years as a test driver with McLaren and some say he should have been given the second McLaren seat this year. We can never know whether he would have had the astounding success of Hamilton in that position, but it does seem likely that he is every bit as talented as the new British super star. Hopefully, we will get to see for ourselves next year - if Prodrive get the McLaren chassis and if Gary is one of their drivers. My guess is that he will be very good in F1; I don't want to ruin his chances with a jinx by saying anything too optimistic so I'll just advise: keep your eye on Gary in 2008! My choices for ProDrive drivers are de la Rosa and Christian Klien. I offer the same reasons Clive stated in his opening lines: "That would not be a bad pairing, the experience of de la Rosa teamed with the youth and speed of ....... " And Klien has already got past his rookie year. Davidson would be a alternate choice. Of course it's fun for us to speculate; prying (or BUYING) these drivers from their current positions is yet another issue. Paffet? I say leave him at Mclaren.......for Richards common sense should dictate that organizing a start-up team and breaking in a fresh driver at the same time is just too many variables. BOTH his race drivers have to be 'ready to race'.